to buy cattle to resell. Trini benötigte 1450 US-Dollar, um ein Gewerbe im Bereich Landwirtschaft auf- oder auszubauen. Das Geld wurde gesammelt und für Trini bereitgestellt. Trini, 64, lives in her own home and has three adult children. 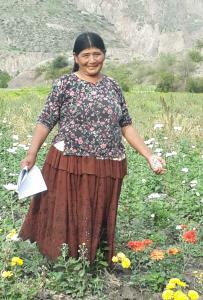 Despite her age, she continues to work in farming and ranching. She also earns retirement income, but the payments do not cover her expenses. Trini has been a widow for several years. She wants a loan to buy cattle, which she will later resell. Trini hopes they will help her because her children have many expenses caring for their own families.